Last week, a friend of mine told me that his father had passed away. I lost for words. I didn’t know what to say to him because I knew how useless words were to those who have just lost their loved ones. How do I know that? I do because I lost my dad when I was sixteen. The friend’s sad news got me think how on earth I had got through the tough time. Well, at first, I didn’t do anything. At the age of sixteen, of course I knew the concept of death. But, Dad’s death happened suddenly and quickly. Plus, I had never lost someone close before (at the time all of my grandparents were pretty healthy). So I struggled to digest the fact that Dad’d gone forever. I didn’t cry at his funeral nor the weeks that followed. Everything felt just unreal. Finally it hit me, about three weeks after his funeral, when I sniffed his cologne. So how did I get through the grieving? My family, relatives and friends’ supports, of course. My mum in particular did everything to fill the void in our home. She is my hero. But I also made a (kind of) quilt. One beautiful day during the spring break, I grabbed a sketch book and went outside. My family had (and still do) a big garden and it was bursting with spring colours. I sat on the ground and sketched old cherry blossom trees that had just started blooming. Then, I thought it would be nice to make something out of these sketches. 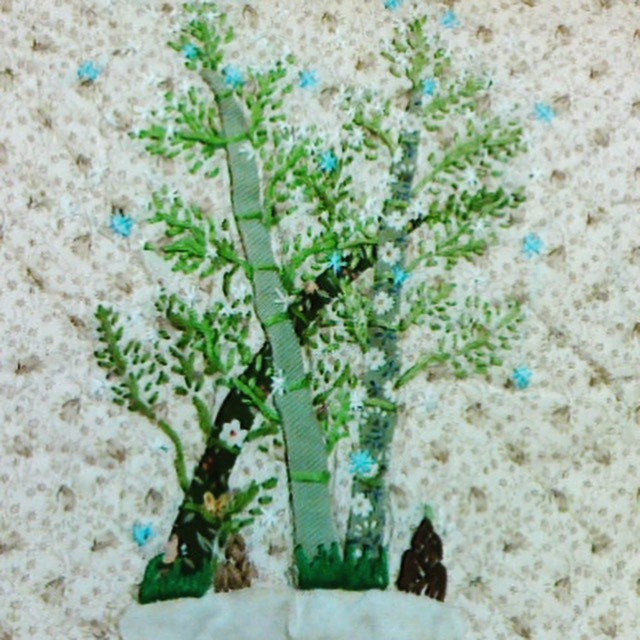 So, first, I patched together bits of fabric to make a background/base, then I embroidered a cherry blossom tree and flowers on top of it. After I finished the spring scene, I decided to the four seasons, using my memories of our garden in other seasons – summer with blue hydrangea, autumn with persimmon trees and winter with snow-covered bamboo trees. I spent all the spring break just sitting in the garden, sketching and sawing. At the end, I made them into a some kind of garment case. This project saved me. It made me get out of the house. It gave me something to occupy myself. And, what’s more, I created something beautiful (at least to my 16-yo eyes). The process was therapeutic, channelling my negative energy/thoughts/feelings into something positive and productive. And it have become my second nature, as if a defence mechanism, to create something whenever I go through hard times. For example, when I had a massive breakup, I wrote and drew Emma. First and foremost, I create things because I love doing it, not just because I need some pick-me-ups. I draw, paint and make things when I’m happy, sad and everything in between. What I want to say here is that I create because it’s my way of venting myself. I strongly believe that people should ‘voice’ their feelings and thoughts no matter hard or embarrassing especially when going through hard times. It doesn’t have to be literal or direct. For example, my creations are hardly depressing, if not melancholy, even if they’re born during my dark times. You just need to let out whatever sitting inside you in your own way. So, this is why I create. What about you? One maker’s explanation of “why I create.” Please leave comments and likes at her blog. Beautiful writing and creative way of dealing with suffering. You are an inspiration for me to draw. Thank you for your comment😊 I’m glad to hear that my little post inspired you to draw. Drawing is a great way to connect with yourself. Enjoy drawing! your work is just charming. You might enjoy Janet Bolton’s work. I have several friends who made beautiful work whilst working through the grieving process. Thankyou for sharing. You’re welcome and thank you for your comment 🙂 Janet Bolton’s work is lovely! It reminds me of Micao Hirasa.